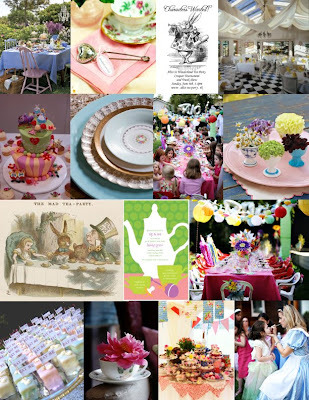 Turn your backyard into a wonderland, and host a whimsical tea party for your little girl's birthday. All it takes is some creativity and an overdose of brightly colored, layered and eclectic decorations. Think flowers, paper lanterns, mixed chairs, patterned linens... and perhaps some 'eat me/drink me' labels for the food and a topsy-turvy cake for good measure. Invite the girls to wear their favorite party dress and you can provide silly 'mad hatter' hats for them to decorate, or red rose hair clips (we're painting the roses red...) as favors to take home. For older girls, if you have the space, how about a game of croquet?